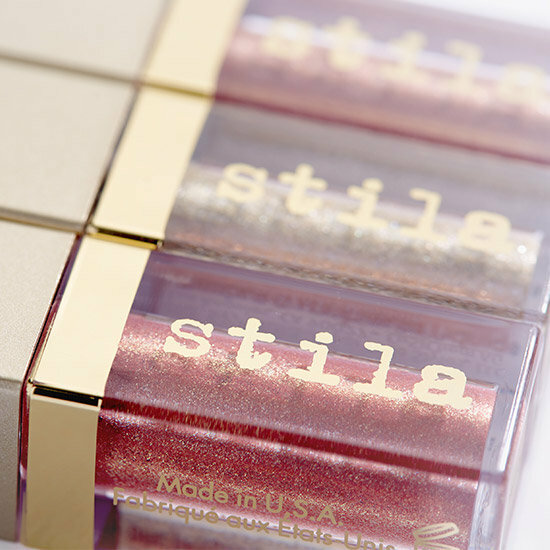 Dazzle in duochrome with this travel-friendly trio of Stila’s best-selling liquid eye shadow. 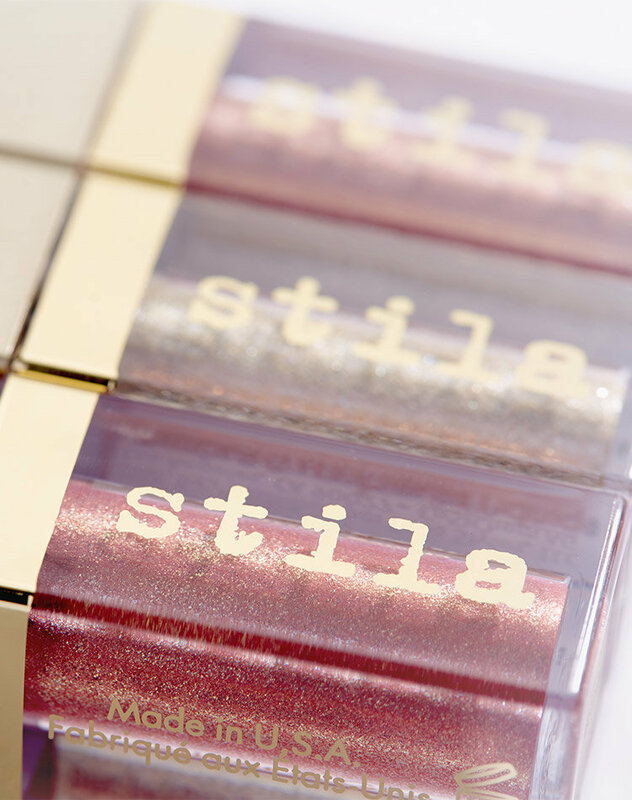 Three exclusive shades of Glitter & Glow Liquid Eye Shadow adorn eyes with holographic, iridescent shine. Unlike loose glitter, there’s no flaking or fallout—once it dries down, it locks into place until you take it off. Use the wand applicator to apply one coat over your lids. Use your finger or an eye shadow brush to blend the edges as the shadow sets. Wear alone or over eye shadow. Dollish is fiery. Very pink, very gold, very fabulous both packed on and sheered out. Stylish is meh. Chunky, uneven, and most disappointingly: when you sheer this one out, the glitter particles show up dark in certain light. I have in my stash the Rose Gold Retro of the first Glitter&Glow range, as well as Cloudy (my favorite!) and Sunset Cove of the later ones, and none of those have this kind of unappealingly visible particles as the Stylish one has. So, meh. Embellish is lovely, and the most everyday wearable of these. I do not see so much the lilac in it as the description says, but it is a lovely toned-down color. I think as a whole this is a nice little kit to try the product. Even with the disappointing Stylish you can make it work using it on top of a dark color. That way the dark particles disappear to the base. I'd also recommend this to be given to your sibling, godchild, or your best friend as a fun little Christmas or Birthday present. Disappointed because I received this set with my luckybag, and 2 out of the 3 shades were dried out and pretty much useless. The one shade dollish was very pretty, opaque and applied evenly on the eyelid. Unfortunately, this product is a dud. 2 out of the 3 glitters were incredibly sheer. They barely show up on they eye, even if you build up several layers. One of the glitters is very pretty, but it's better to just buy the one. I've tried other trios like this from Stila that I love. This one let me down. Pros: You get to try multiple colors Price I love minis! I normally love these. This kit has a couple of duds though. Save your money. Buy a single or a different kit. I love the colors but one of them was almost empty and dried out. It happens to be my favorite color in the set. I usually love these but I was disappointed by the set. I received this trio of glitters September 4 and have been using all of them intermittently since that time. They're all still going strong, and each time I've used any of the shades, I've been quite pleased. I've found these glitters to be very easy to work with. They are pigmented but can be sheered out if I choose. Either way, all three glitters show up beautifully on my eyes. Dollish is absolutely beautiful, and Embellish is delightful, very versatile. Those two are "loves." Stylish is my least favorite, but this glitter is still a "like." No duds, which of course pleases me. I've purchased these $25 sets before, both in the glitter and the shimmer formulas, and I can say with confidence that this has been my favorite set to date. So creamy gives my shadow a perfect touch of sparkle! This was great for someone who can’t afford to by 3 individual colors this set was great. I gave a 3 stars due to the colors being gorgeous. But unfortunately like the magnificent metals these irritated my eyes I wear contacts, and I noticed my eyes being watery to wear my eyeliner would smear and come off from the outer corner of my actual eye. My contacts became a little irritating also, but my eye skin started to become sensitive to touch and dry. Very happy with the customer service but very disappointed in the products... they were dried out. I was very excited to get the liquid eyeshadow but it’s almost like they are half empty and dry at the same time. 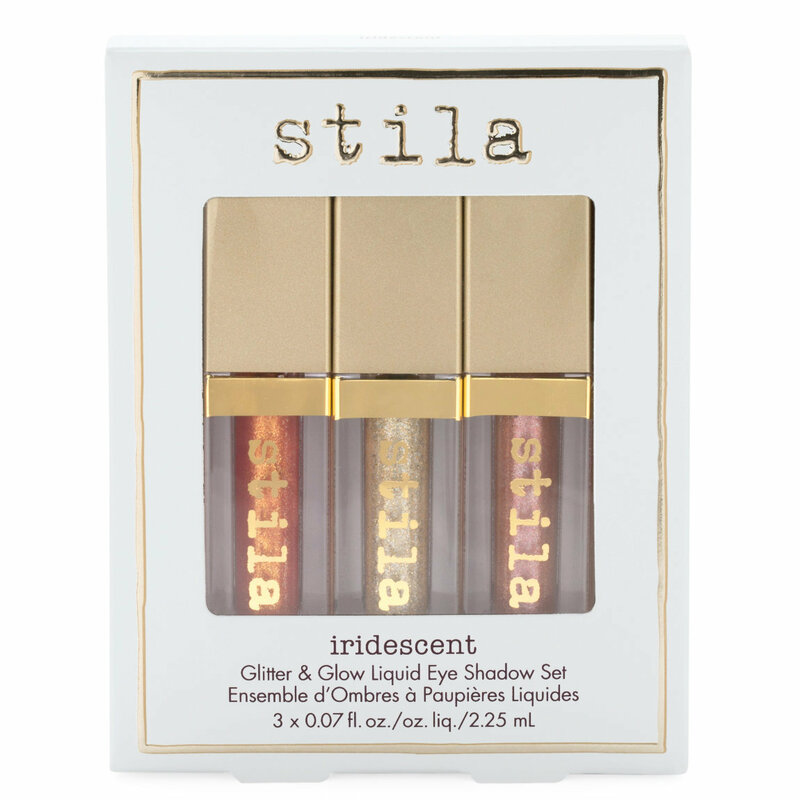 I was so excited to receive the Stila Iridescent Glitter & Glow Liquid Eye Shadow Set in my 2019 Luckybag. What a disappointment. All three products were mostly empty, and the portions that I could scrape off the sides were dried out. 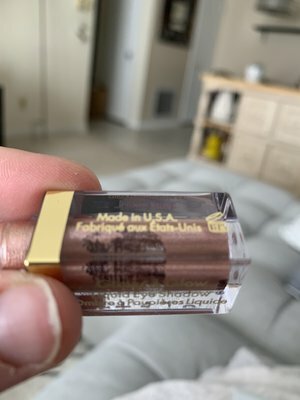 Do not purchase this product.